Houston is suing Volkswagen for $100 million claiming its cars that evaded U.S. emission standards "spew dangerous chemicals" in the air surrounding the Texas city. The Harris County attorney filed a lawsuit against Volkswagen Group of America on Wednesday. The city's air quality is below national standards, and the county attorney said the Volkswagen vehicles that skirted emission regulations set back Houston's clean-up efforts. Volkswagen Group is under fire for tampering with some of its diesel models, allowing them to cheat EPA emissions tests. It affects 11 million of the company's vehicles worldwide, and the county says at least 6,000 were sold in Houston. 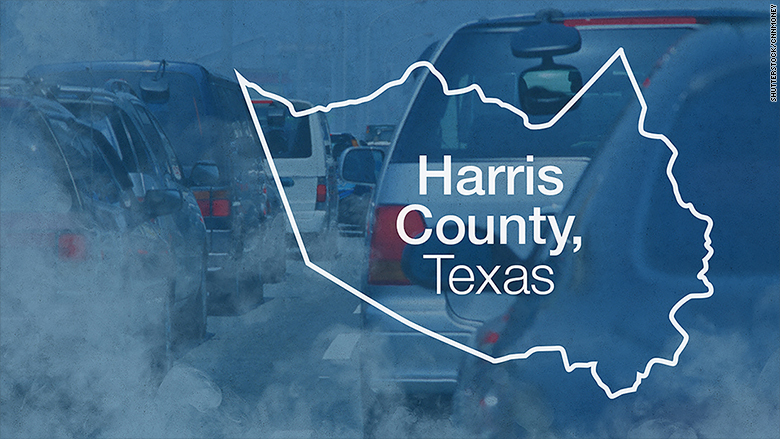 "Harris County has long been plagued with poor air quality due to emissions from various sources, ranging from industrial to vehicular traffic," the county's court filing says. "Volkswagen's deceptive acts have undermined Harris County's efforts to improve air quality, reach attainment status, and protect our citizens." The issue is nitrogen oxide, which turns into a harmful form of ground-level ozone and causes breathing issues. The Volkswagen cars at issue emitted about 40 times the EPA's permissible levels. Houston's air is below national standards and ozone in particular has been an issue for the city, though its problem is not among the most severe in the country. Volkswagen and the EPA declined to comment on the Harris County lawsuit.